I’ve just moved flats, so have the joy of calling telecoms engineers on a daily basis in an attempt to set up a new phone line & internet connection. Hence, my contributions will be like my bowel movements – very patchy & irregular (sorry if you’re mid-way through your cornflakes). I’m presently writing this on free wi-fi in the Barbican, so will only check in once in a while till I get the flat connected. In Saturday’s Guardian newspaper’s Weekend magazine there were a series of articles on how the last decade have made huge differences to the world we live in – ’10 years that changed EVERYTHING’. Amongst the articles was a great piece on technology & communications by Alan Rusbridger entitled ‘Power to the People’. He makes good arguments for the 10 things that have changed our lives in the highly evolving areas of internet & technology. I’m relatively new to Twitter but agree with his sentiment. It’s an amazing communication tool & really feel it is revolutionising the way we find, disseminate & discuss information, news, etc. I really feel it has that incredible potential & like Mr. Rusbridger think it will become as prevalent, dominant & useful as Google has. What technologies do you think have changed life (for good or bad) in the last decade? A new ‘diet’ has hit Twitter. ‘Tweet what you eat’ is not so much a diet, more an online food diary with calorie calculator that people can use via Twitter. The combination of accurately recording your food intake coupled with displaying it for chosen friends seems to be sufficient to enable people to lose weight, i.e. ensuring you know what you’ve eaten & recording it on the go via Twitter & even getting encouragement/discouragement from friends & family seems to allow those watching their weight to shed the pounds. Twitter-phile Stephen Fry is reported to have lost 6 stone (38kg or 84lbs) in 6 months, whilst the original comedic Little Britain Fat Fighter, Matt Lucas, has lost 1/2 stone in a fortnight. Personally not a big fan of fad diets, think it’s far healthier to enjoy what you eat & attempt to burn it off with exercise if able, but using mobile technology like Twitter in this format seems a good way to record your diet & share the process with family & friends. GO! Reveal yourself, caller – but not you, Banksy! One of the coffee smelling ingredients of a successful community is to write from the heart and be yourself! With the advent of social networking many of use chose to use different names, multiple personalities and create an online brand that is different to what lies behind the scenes. There’s a balance of course – with identity theft and folk ‘knowing too much’ but where do we draw the line? 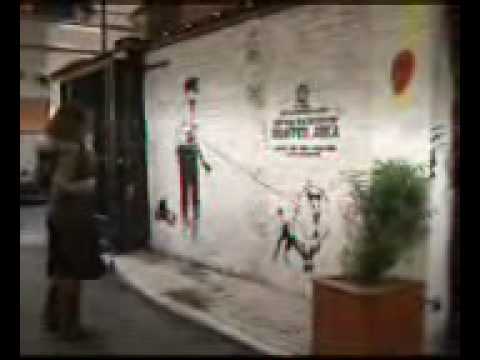 Does graffiti artist banksy everhave that issue – probably not! As I finalise the 10 contributors for GO! Smell the coffee and get my head around community guidelines I’d welcome any comments relating to this topic of identity. So, reveal yourself, caller or does that take away the ‘fun’? GO! Tweet about about it, Iran as Tehran tweets! Many of you on twitter yet? The 140 tip-taps of the micro blogging site appears to be the lifeblood for Iranians to get the word out. No doubt the hundreds of thousands of people who read the various bloggers from Iran like what they read; otherwise they wouldn’t venture onto the streets so much. So great has the notion of Twitter‘s role in the Iranian protests become that the U.S. State Dept. reportedly asked the company to defer some maintenance. Twitter says it rescheduled maintenance work from June 15 to later the next day, or about 1:30 a.m. in Iran. “It made sense for Twitter…to keep services active during this highly visible global event,” the San Francisco company said on its blog. As many bloggers & facebookers still shun twitter with this example in mind share you comments here on where you see this microblogging service going, in of course, 140 tip-taps of less! The future of media, an integral part of it or a craze that will pass. Comments welcomed, wherever you are. Cheers…. What is the big deal with twitter, Wossy? Twitter – it’s a HUGE deal as the 140 character micro blogging website that is taking the globe by storm. Massive, in fact and one that google are negotiating to buy right now. I shrugged twitter off at first, as I did with my first viewing of the Simspons and Family guy but then dug deeper to see what all the fuss was about. Wossy has over 186,000 followers and we have a more humble 1,155 but gradually climbing daily, like all good flowers should. Rather than shun publicity celebrities are very much pushing the twitter boat out with the likes of Jamie Oliver, Borat and Barack Obama. Is it REALLY them, you may ask and why bother to get the extra online exposure to connect with other? Dubai based DJ’s Catboy & Geordiebird who ‘keep it real’ here in the morning and help give the manic Emirates morning some sense of normality also tweet merrily along keeping all their followers updated. So, do you tweet, want to tweet or don’t really understand the need to tweet? Do tell! My Buzzing with Ange site is being overhauled and will have a shiny new look with lots more content going in there very soon. I’m in product creation mode too where I’m developing Social Media and SEO tutorials which will help increase traffic to your sites and getting ranked in Google. I have been spending a lot of time on Twitter which inspired me to create Social Networking News Daily. I have teamed up with Clint Maher who loves working in the backend of WordPress and is working on a series of videos as tutorials to bring you up to speed with your WordPress blog. Another rather exciting event happened last week. I was featured in the Geek Girl Bloggers list on Tim Miller’s Spy Journal 3.0 blog. Yup… Ange Recchia is officially a Geek Girl LOL. That’s the very short version of what I’ve been up to. In amongst all this, I do take time out to breath… sometimes… and came across this beautiful YouTube video which I think you’ll enjoy. I think they are just awesome. Do you? Smell the flowers: quicker & twitter! Well you know – it works on many levels – this speed thing as it’s what modern day online society DEMANDS. Recently redundant Jim in Dubai here and many of you have rightly tutted at the HUGE amount of time it takes GO! Smell the flowers to load. Thanks to tech whizz Deep in Mumbai has ramped up our WordPress version and valuable input from Flowers contributor Anges Biz over in Oz and hey presto – a quicker flower smelling experience for you and it’s about to get quicker! We’re going full steam ahead (choooo choo) with the Buddypress social network software and are currently making waves on twitter (https://twitter.com/flowersmeller) now I’ve a bit more time on my hands it’s time to help the flowers bloom. Anyone else on twitter here? Do tell together with any comments about the loading time of the GO! Smell the flowers website, Cheers, tweet, tweet.